A little over a year ago, some of my fellow mozillians and I decided we wanted to have a place to host websites and e-mail, stick off-site backups, and perform other disk or CPU intensive things not typically permitted in a shared hosting environment. 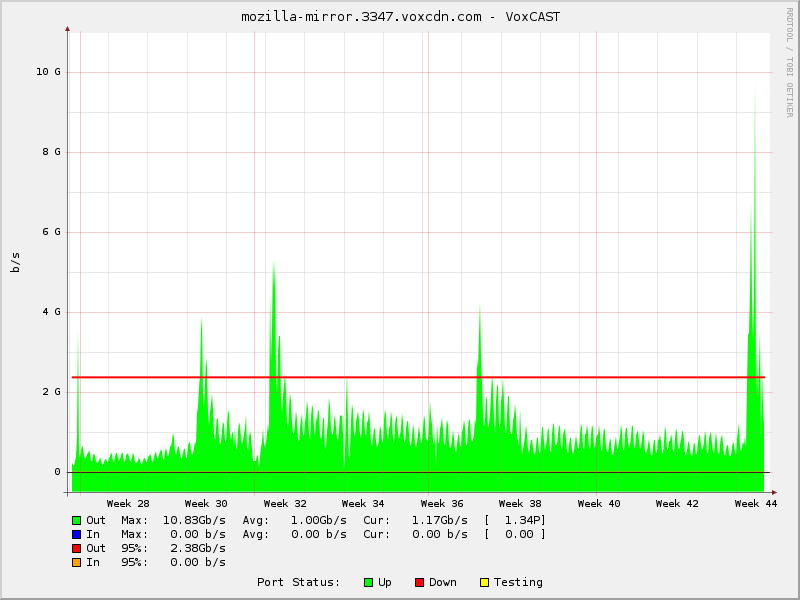 After exploring a few options, we decided to split a dedicated server and eventually settled on Voxel as our host. Of course, with just a few low-traffic websites, backups, and an SSL cert survey or two, we typically found ourselves far under our monthly included bandwidth. 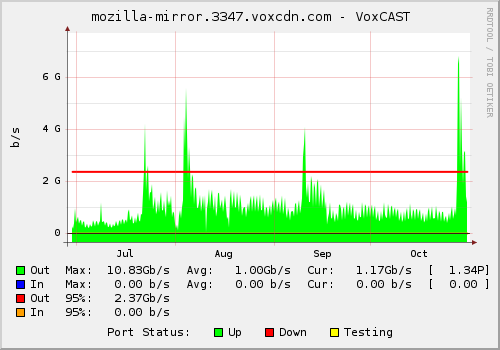 Not wanting to leave our investment underutilized, we took advantage of our server package’s included access to the VoxCAST CDN and put it to work as a Mozilla mirror. 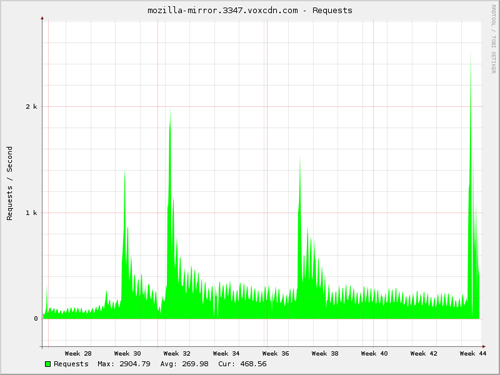 Mozilla’s Bouncer mirror management system distributes traffic proportionally, based on assigned weights. Since we only had a small amount of bandwidth to offer compared to most of the other mirrors in the system, we usually kept our mirror’s weight low to avoid eating up our entire bandwidth allotment. Firefox 3.0.11’s release happened to line up with the end of a billing period where we had some extra bandwidth leftover, so we decided to burn through it by increasing our weight dramatically. Our traffic quickly climbed from a few Mbps to over 3Gbps, which managed to grab the attention of the folks in the Voxel NOC. They pinged us to make sure we were aware of the situation, and after learning what the traffic was being used for and a few discussions with Reed², they generously offered to donate a substantial amount of bandwidth to be used by the Mozilla mirror network. Everything got setup just in time for the Firefox 3.5 release, and in the four months since, we’ve served more than 1.3 petabytes of updates, installers, and add-ons. And all of that coming from a single origin server that, thanks to VoxCAST, is so lightly loaded it’s able to run a BOINC client most of the time! As impressive as that is, it’s worth noting that this mirror only accounts for (as of this writing) just over 25% of the total available capacity. Mozilla wouldn’t be able execute releases and updates for all its products with the same level of quality and reliability we all currently enjoy thanks to the behind-the-scenes and often unsung heroes of our mirror network. So to those who volunteer your time, machines, and bandwidth to make every release and the day-to-day a success, thank you. Mozilla simply wouldn’t be able to do it without you. Landed bug 499123 on the 1.9.2 branch. Bug 475289 landed on trunk for a ~20ms improvement with the currently shipped plugin set. Reduced the number of getService calls in the microsummary service. Wrote a patch to get the search service using the new update-timer category, removing one of the last few pieces of non-critical work the search service does on startup. Need bug 520334 to avoid losing the benefits of 475289 once we ship a plugin with an update URL. Work on delaying spell check dictionary initialization in bug 496217.